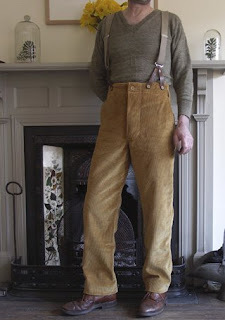 Within a week I have had made a pair of corduroy pants, which cost when done $1.60. They are of that peculiar clay-color, reflecting the light from portions of their surface. They have this advantage, that, beside being very strong, they will look about as well three months hence as now,—or as ill, some would say. Most of my friends are disturbed by my wearing them. I can get four or five pairs for what one ordinary pair would cost in Boston, and each of the former will last two or three times as long under the same circumstances. The tailor said that the stuff was not made in this country; that it was worn by the Irish at home, and now they would not look at it, but others would not wear it, durable and cheap as it is, because it is worn by the Irish. Moreover I like the color on other accounts. Anything but black clothes. this is great! something i did not know about Thoreau.